When I started university at the age 18, I began with a major in Environmental Studies. Like most young liberals on the West Coast USA, my mission was to save the world. Little did I know that Operation Save the World came with a heavy dose of math, chemistry and other science intensive studies. Although I did well in the sciences when I applied myself to them, my heart wasn’t moved by formulas and calculations. It was when I discovered the field of Cultural Anthropology that I had at last found my niche in the university. As an American with parents of immigrant backgrounds, world cultures captivated me and inspired me. How do other people see and interpret the natural world? How do they understand the metaphysical world and relate to it? The first real spiritual awakening had come about in my reading of Philosophy of the Masters by Sawan Singh. With a Catholic mother and an Islamic father, I had long ago settled on science as my religion. But something stirred within me at the realization that we are all parts, not insignificant, in the massive, unfolding universe and if we are that, why shouldn’t we be able to know ourselves and all that the universe encompasses completely? Thus began my real journey into what is coined as self-realization via meditation. Along with my process of delving into such spiritual scriptures as the Bhagavad Gita, the Ramayana, etc. also began my focused academic journey into South Asia. To familiarize myself with the culture in a way text books and scriptures alone couldn?t reach, I decided I’d study abroad in the Indian subcontinent for a year. What I experienced about the cultures of India while abroad thrilled and fascinated me – the lights, the colors, the sights, the smells and chiefly the humility and devotion people felt toward the Divine. As Westerners, we look at Hindus and say wow they have a million Gods and Goddesses that are multicolored and have excessive arms… With a closer look at hinduism, you will see that the colorful pantheon of deities is representative of the various aspects of our own nature. There is a fondness for storytelling as a way of teaching moral principals about life, love and devotion. The first time I had seen Indian dance was an Odissi dance troupe of 3 sisters that had performed in my university in California. The moves were rhythmic while sensual and subtle, gracious and still empowered. I was inspired to understand what the dance tales were about and of course to learn the dance myself. It turns out that most classical Indian temple dances are devotional dances, depicting stories about devotees and their beloved, which is in fact divine in nature. My senior thesis was a compilation of this work entitled Lives of Lovers and the Beloved: The Devadasis of India (devadasis are the women whose lives are devoted to dancing in the temples in India). Although my own dance interest began with the temple dances of India, they have evolved to encompass the world of middle eastern belly dance and modern fusion. To be more authentic to my own culture, life experiences and musical tradition, I find that the belly dance fusion genre provides a more personally fulfilling artistic outlet. However, I have not forsaken the idea of dance as an act of devotion. 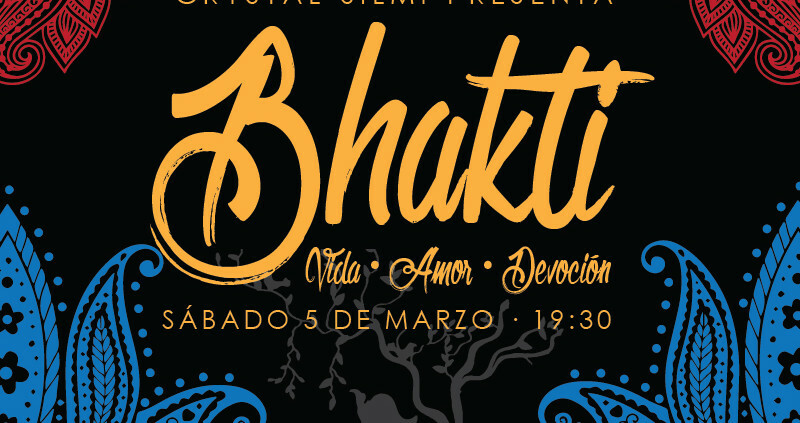 Rather I have fully embraced the concept of making every dance I do an act of Bhakti. Devotion does not have to be to an offering to some arbitrary god-like figure outside of ones self, dancing as an act of devotion can simply mean to be conscious of one’s place in the humbling human experience and feel gratitude for that experience. 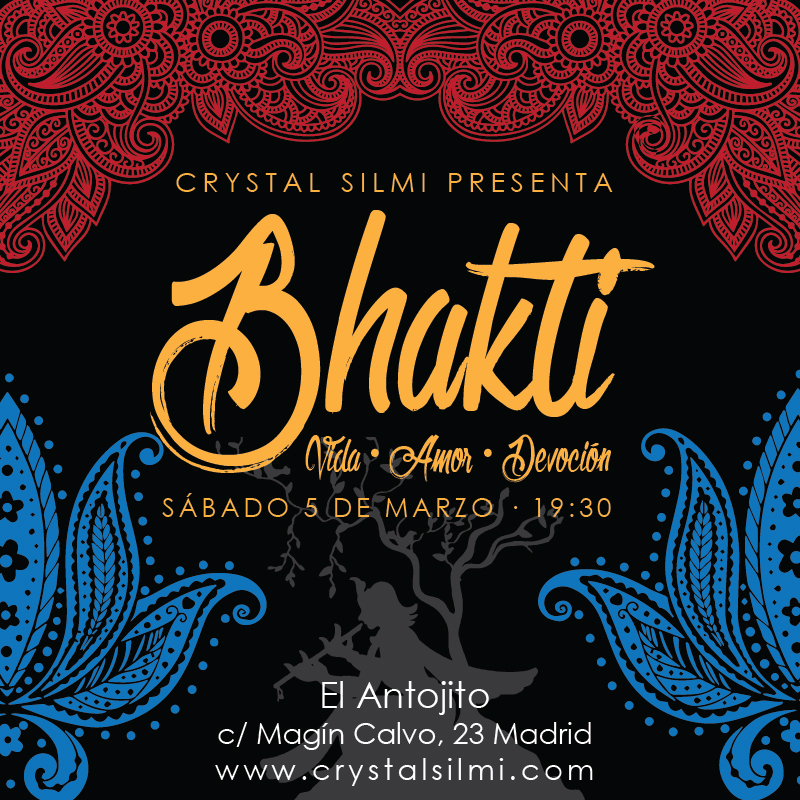 The event BHAKTI that I am preparing for March 5th, 2016 at El Antojito in Madrid will ideally give dancers a platform to express their inner sentiments toward life, love and devotion. We hope you will join us in this special celebration to commence the beginning of Spring!